The Congressional Black Caucus is not about to approve of anything President Trump has done, is doing, or will do. He can raise the black household income 100% and they will still snarl at the mention of his name, always pulling the race card. “Trump is a RACIST!” because that is all they’ve got and the sure sign of fools who have lost an argument and have nowhere else to go. 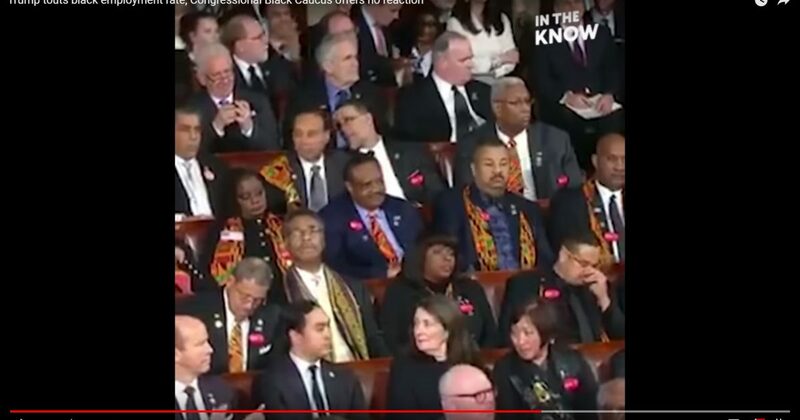 During the State of the Union Address, President Trump cited the lowest black unemployment rate in history, certainly good news for blacks, but not these ungrateful parasites. They sat there in their seats, completely expressionless, like passengers on a bus. Meanwhile, liberal weenies took to the airwaves following President Trump’s historic address, slamming him for taking credit for the low black unemployment rate that was obviously, in their twisted view, the work of Barack Hussein, who spent eight years blaming everything that was wrong with America, including the black unemployment rate, on George Bush, and will now spend the next seven years taking credit for all of the historic economic upswings underway…. like the lowest black unemployment rate in history. I wonder how Hussein will take credit for the historic Trump tax plan, which clearly generated our current runaway economy.